In a matter of days the entire world will be united under one common cause: The World Cup. I have my jersey laid out and ready to go in support of Ghana’s Black Stars, of course! Football, or soccer, is a passion shared across many cultures and creeds. Given that the Mundial is the very apotheosis of the sport, the anxiety of fans the world over is patent and palpable. It is difficult to fathom the significance of the tournament if you are not from a country that lives and breathes the sport as Ghana does. (I can still taste the bile that rose up my Malaria-stricken throat that day Suarez denied us a place in the semifinal). In commemoration of the 2014 World Cup which will kick off in Brazil on June 12, guest contributor and zealous supporter of the Black Stars, Dr. Edjah Nduom* sheds light, through personal narrative, on what the national team, the World Cup and soccer mean to Ghana at large . Who will you be cheering on to victory? 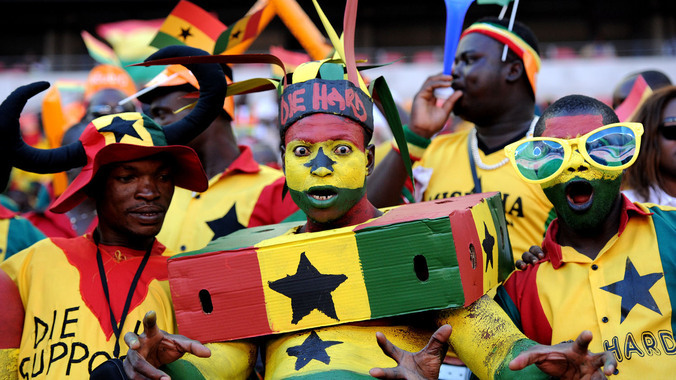 Ghana soccer fans fully clad in the nation’s colours. The love of the national team is the universal language of the Ghanaian people. To talk about what the 2014 World Cup mean for Ghana, we must have some context – Ghana has won two U17 World Cups, and won the U20 World Cup in 2009. Our senior team, the Black Stars, have won four African Cup of Nations tournaments. We boast one of the greatest African football players ever, Abedi Pele, in our ranks. And yet, we had not qualified for a World Cup until 2006. 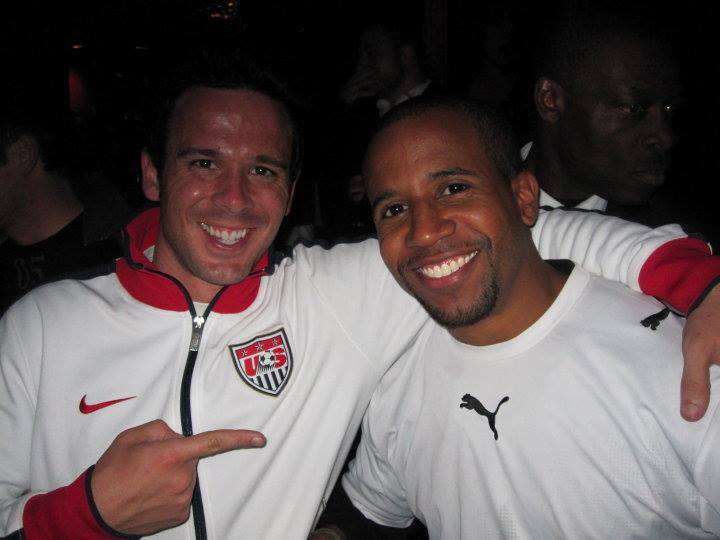 So, when we arrived in South Africa in 2010, survived our group and vanquished the United States for the second time in two World Cups to make it to the quarterfinals, there was certainly a feeling of a destiny to be finally fulfilled. The Black Stars, African football royalty, would finally be recognized for the winners that we had always been. Here we were, in the quarterfinals of the World Cup, as far as any African Nation had ever gone, but this time, on African soil. We were the only African team left standing, and as such, had been adopted by the locals, calling us BaGhana BaGhana as an homage to their national team, Bafana Bafana who had been eliminated in the first round. I attended the first two Ghana matches in SA, and when we would unfurl our flag in public, we were met with cheers all around. In this first of quarterfinal appearances, we were facing Uruguay, a team with some talented players, which had won the World Cup years before; still, not a team that we were afraid of. You could not have scripted a better path for us to make the semifinals. Ghana was dominant throughout the match. Ghana scored first, and I celebrated. I was watching the game on my phone in the back of a church, waiting to accompany a good friend of mine down the aisle as a groomsman, but my passion for the game had temporarily rallied the other (American) groomsman and the groom himself around me, all of them rooting for the team that had defeated the USA. They could all tell that history beckoned. 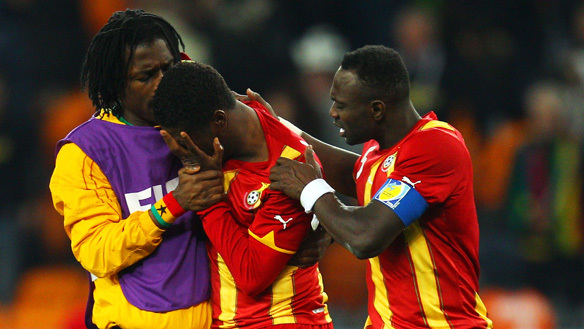 Uruguay equalized off of a precise free kick, but Ghana remained dominant. The game went to extra time. In the second period of overtime Ghana laid siege on the opponent’s goal. Ball after ball was driven into the box. A goal seemed imminent, but time was running out. Finally, as the clock approached the fateful 120th minute, a ball was sent in, and there was chaos in the Uruguayan box. In truth it was difficult to follow on a phone, but finally, it seemed a ball was heading goalward. It must be a goal! Scored by Adiyiah, one of the stars of the winning U20 team, who had finally fulfilled his potential! Ghana was given yet another penalty, its third of the tournament. Asamoah Gyan, our savior and leading goalscorer stepped up to take it. Surely, the entire continent’s long wait was over. The semifinals were waiting in the wings. Ghana would finally answer the dreams of so many and face a Netherlands team that we matched up with favorably. He stepped to the ball, drove through it… and the ball tipped on the top crossbar and flew over the goal into the stands. No goal. The match would go to penalties. So where are we now? In Brazil, we will not have the home crowd of our continent. Essien, one of our brightest stars in 2006, injured during the 2010 tournament, is back, but he is not quite the Bison he once was. The brightest lights of the victorious U20 team have matured, and it is their time to shine – a group that includes one of the sons of Abedi Pele, our onetime leading scorer (in fact, he has two sons in the squad, Dede and Jordan Ayew). The captain’s armband has passed to Asamoah Gyan, who has redeemed himself. He led all of Africa in scoring through the qualifiers and has been on fire in obscurity, playing in the UAE. He no longer takes our penalties, but he remains our all-time leading scorer, scoring in better than every other game we play. Kwadwo Asamoah plays a prominent role for Juventus, who won the Serie A title in Italy this year. There is great agony in being a fan of the Black Stars. Putting so much faith into 11 men in a game is difficult. When they fail, it hurts. No true Ghanaian fan has of yet recovered from the match with Uruguay. Suarez is still a dirty word in Accra and frankly, in Africa. When the team plays, no business is conducted in Ghana: the nation is at a literal standstill. There are no people on the streets. When we score, the taxi drivers honk their horns, and you can hear the joyous streams throughout the country, as the collective sound of “goaaaaalllll” rises up and fills the atmosphere. We have been drawn into the group of death with Portugal, ranked 3rd in the world by FIFA, and Germany, ranked 5th and, of course, our old friends, the USA. I am excited, but I am afraid. This is probably the most anxious than I have ever been, save the day of my marriage or the birth of my first child. I know our team in a way that FIFA does not; in a way that neither Portugal, Germany nor the USA do. So what will happen in Brazil? Against the USA, there is no prediction, only a mandate. If we are to fulfill our potential as Africa’s first semifinalist, then we must beat the USA AGAIN. We cannot wish or dream of a semifinal path that does not include dispatching them. That does not mean we think it will be easy – we have only beaten them 2-1 in both matches – but it means that if our World Cup does not begin with this win, then we almost shouldn’t bother hoping. That is how I feel; this is what all Ghanaians know. The next match is against Germany. They ran roughshod over much of their opposition in South Africa, and yet… they only beat us 1-0 in South Africa. They are dealing with injuries to many of their key players, and they recently tied Cameroon, a team that has lost much of its luster, 2-2 in a friendly. Their 6-1 scoreline against Armenia flatters them, but does not mean they are on top of their game. A cautious man will hope for a draw in this match which, coupled with a win against the USA, should keep us alive, at least until the Portugal game. But real Ghanaian fans that have been watching these teams closely know that our pace is potent. We know that their back four is suspect at times, and their young team which seemed so dominant in South Africa has flair for days, but can be beaten. And for this reason, my irrational hope sees a win in this game. That leaves us with Portugal. Their Cristiano Ronaldo, the most recent recipient of the Ballon D’Or, for the world’s best player is a lethal striker matched up with our, at times, shaky back four. He is, however, fighting knee and thigh injuries. This Portugal team played to a draw with Greece. They have just barely beaten a Mexican team in the 93rd minute, but in truth, Mexico could easily have had 2 or 3 goals at that point. There are many talented players on this side, but without a fit Ronaldo, their bite is significantly lessened. If we manage wins versus Germany and the USA, I think we sit back, attack on the counter and settle for a tie. 7 points, and we are guaranteed to move on to the next round. Only then, can we talk of our destiny to reach the semifinals. Even putting these words in print makes me slightly ill. Call it superstition, call it a sense of humility, but it is difficult to express supreme confidence in this team after all we have been through. But I will watch. And I will hope. And so will all of Ghana. *Edjah Nduom was born in the USA, but moved to Ghana with his family in 1991: just in time to see Ghana win its first U17 World Cup. Many excruciating and exhilarating matches later, Edjah has attended the 2010 World Cup in South Africa and can hardly sleep waiting for his trip to Brazil for Ghana’s matches in this year’s tournament. 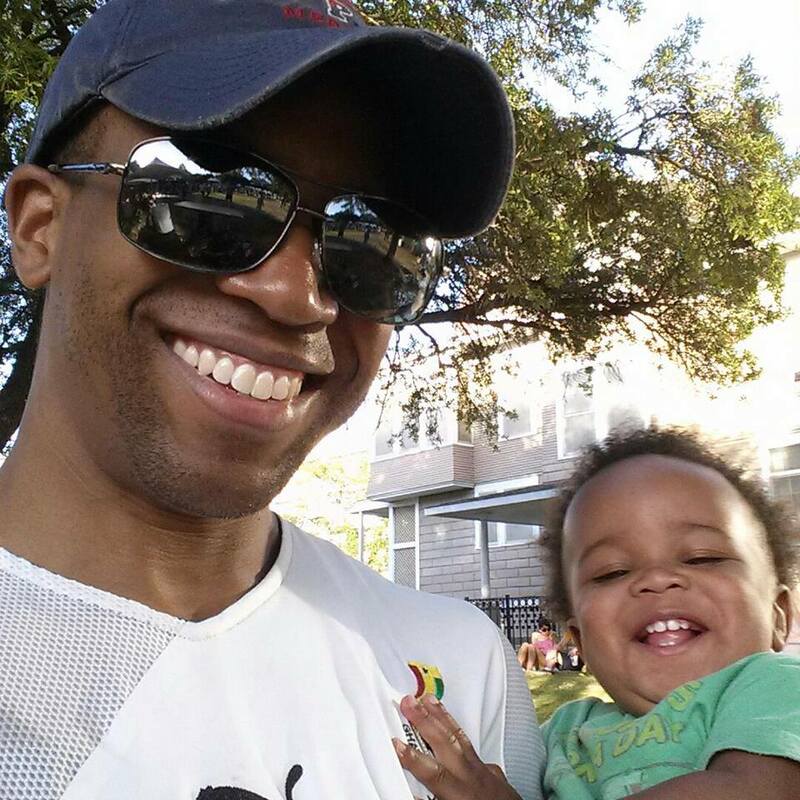 Between tournaments, Edjah is a neurosurgeon, specializing in the treatment of tumors of the brain and spine. He resides with his family in the USA. Lawd have mercy! I’m not ready. Be ready, Lola. Wear a diaper if necessary.